Find replacement Frigidaire filters for less at Allergy Be Gone. Replace your Frigidaire FC-100, FC100, WF2CB, SWF2CB, NGFC 2000, NGFC2000, and NGFC-2000 parts. It can also be used as a replacement for Kenmore 46-9911, 9911, and 9916 parts for Kenmore refrigerators that were manufactured by Frigidaire. 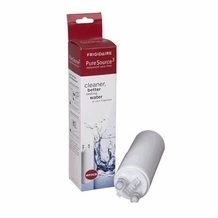 Our WF3CB filter fits all front-cassette Frigidaire refrigerators to reduce 99 percent of cysts, lead, and turbidity, while also reducing sediment and chlorine’s taste and odor. While the Frigidaire WF3CB filter removes sediment and other contaminates, it does not remove fluoride or other beneficial elements in your water supply. This design comes with slide-in and slide-out technology for easy installation and replacement. Frigidaire recommends that your ice and water filters be replaced every nine months for maximum flow and water filtration. The water filter FC100 may have visible resin in the filter casing. This non-toxic resin is created in the sonic weld process and is NSF-approved.